Author and nature artist John Muir Laws blogs many interesting things at www.johnmuirlaws.com. One interesting recent post explains how to draw a frog step-by-step (the image below shows steps 4 and 17). He has also written about drawing insects, plants, and birds. Anyone interested in nature should take a look! Laws also helped develop the CNPS Nature Journaling curriculum, which may be of interest to parents of young biologists. 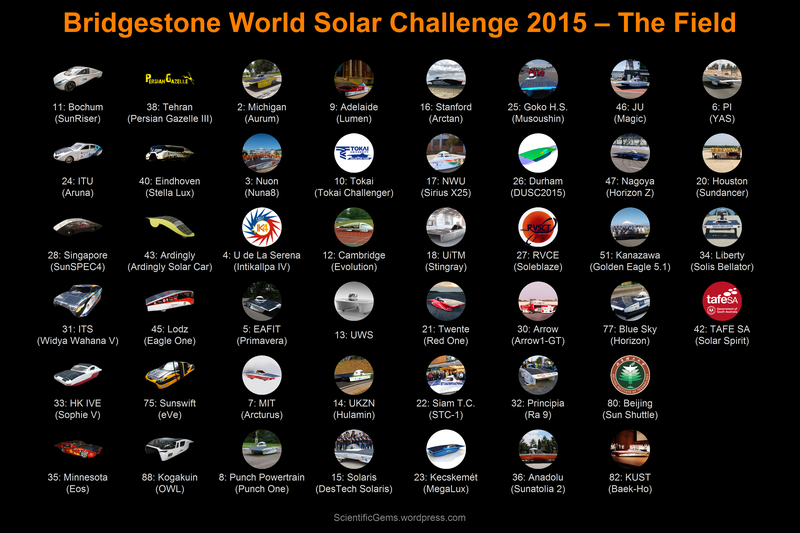 The World Solar Challenge Challenger class is seeing some nice-looking solar cars this year. The majority of cars (19 so far, or 66% – teams 2, 3, 4, 5, 8, 9, 10, 13, 14, 16, 17, 18, 21, 23, 25, 26, 46, 77, and 82) are some form of the increasingly standard flat wing with asymmetrical cockpit. Solar Team Twente’s Red One (photo above by Jérôme Wassenaar) is a good example. This design has aerodynamic advantages, since the driver sits behind one of the front wheels (often, the asymmetry extends to propulsion as well, with only a single wheel being powered). Such asymmetrical cars were introduced at WSC 2013 by a few teams, including Nuon and Tokai. However, some teams this year (9 so far, or 31% – teams 7, 15, 22, 27, 30, 32, 36, 47, and 51), have either retained or built some form of symmetrical wing, like Nagoya Institute of Technology’s Horizon Z (below). Finally, Cambridge University’s Evolution (team 12, below) reflects a quite different, and rather promising, approach. Update: see also the in-depth analysis at mostdece.blogspot.com. The team from the University of Minnesota came 4th in the 2013 WSC Cruiser class, with a time to Adelaide of 51 hours and 41 minutes. Their two-seater vehicle Daedalus was given a practicality score of 69.3% that year. This year, Minnesota are back, and hoping to do better with their sporty new car, Eos, which is the 12th car they have built since since they began in 1990. Good luck, team 35! Solar Team Eindhoven (team 40) is the first WSC team to arrive in Australia from overseas. Below is their first vlog (in Dutch, but subtitled in English) showing testing of Stella Lux at Oirschot military barracks, a (temporary) farewell as the car is crated for transport, and a visit to High Tech Campus Eindhoven. Vlog #2 will be shot in Australia. 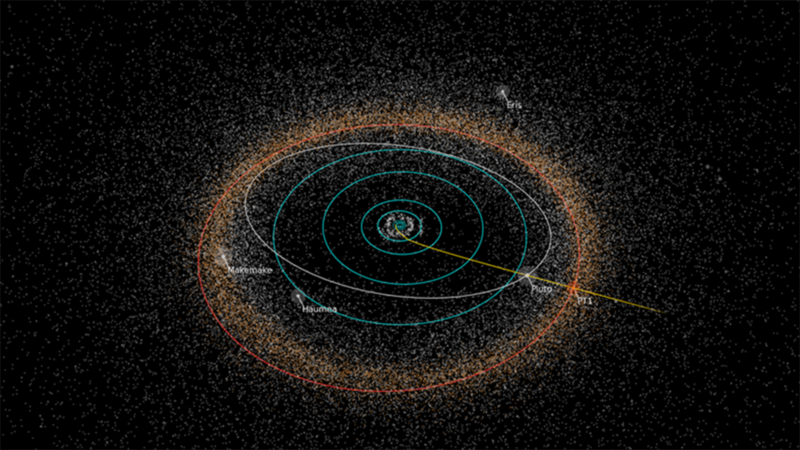 The next object that New Horizons will visit has now also been identified – it is 2014 MU69 in the Kuiper Belt (marked “PT1” in the image below). Arrival is anticipated on January 1, 2019. Fetal pain: what does the science say? Recent years have seen increased attention on the unborn fetus – in particular the question of the fetus feeling pain. Much evidence on this question has come from caring for premature babies in a neonatal intensive care unit (NICU). The modern NICU has allowed babies born as early as 22 weeks (55% of pregnancy) to survive. At 23 weeks, one US hospital reports a 71% chance of survival. Gestational age at which premature babies had a 50% chance of survival, taken from a range of published studies, together with (for 2015) the hospital mentioned above. 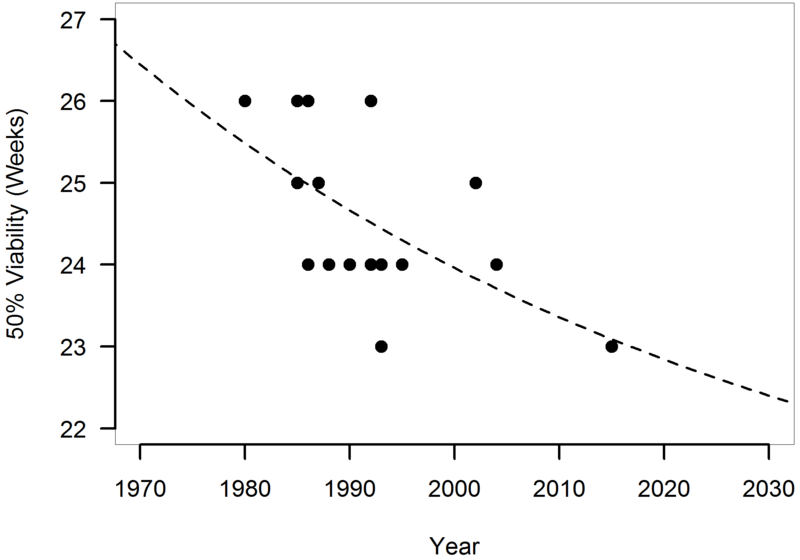 The data fits an exponential decay, dropping to 22 weeks by 2040 (although this may not actually be achievable). Medical staff are generally convinced that premature babies in the NICU can feel pain, and the same is presumably true for unborn babies of the same age. Further attention on unborn babies has resulted from increasingly ubiquitous fetal ultrasounds, from numerous television documentaries on premature babies, and from books, web sites, and apps that encourage pregnant women to track their baby’s development. These have all contributed to the current interest in fetal pain. A 2005 JAMA review on fetal pain was unfortunately tarnished by allegations of conflicts of interest. However, there is a considerable body of other scientific literature on the topic of fetal pain. So what does the literature say? The question of fetal pain is unfortunately confused by uncertainties regarding the role of the cortex in feeling pain, uncertainties about how the fetal nervous system functions, uncertainties about whether “feeling pain” requires knowing the exact location of the pain, and uncertainties about whether “consciousness” is required to truly feel pain. Furthermore, there are actually two separate human pain systems, one primarily affective (concerning the “hurt” of pain), and the other more discriminative (concerning the location of pain). A newborn baby, a puppy, and a lobster. Which of these is “conscious”? Which of these can feel pain? Is it acceptable to kill any of these by boiling them alive? Where on this spectrum do human fetuses lie? However, developmental evidence suggests that the ability to feel pain might begin surprisingly early. Neural pathways to the spinal cord form at 8 weeks. The cerebral cortex begins to form at 10 weeks, although initially it is not connected to the rest of the brain (the cortex continues to develop during pregnancy and long after birth). By 25 weeks, pain-related nerve signals are certainly reaching the cortex. Electroencephalograms have been recorded from 21 weeks. Hearing appears to begin at 18 weeks. At about the same age hormonal stress responses are observed during surgery in the womb. In adults and older infants, such responses are associated with pain. Premature babies show strong responses to pain, and failure to administer analgesia to babies in the NICU undergoing surgical procedures is considered unethical. Surgeons are beginning to administer anaesthesia and analgesia to unborn babies at similar developmental stages as well. It is widely accepted that the fetus can feel pain from at least 26 weeks, but the threshold at which interventions cause distress may be as early as 20, or even 15, weeks. Obviously, it is extremely difficult to be certain where the threshold lies, since fetuses cannot verbally describe their pain. Yet the same is true for newborn infants and animals, and it has long been accepted that pain in infants and animals is nonetheless real. One surgeon recommends fetal analgesia and sedation for invasive procedures from 23 weeks (coincidentally, the current viability threshold), and a number of other surgeons agree, although some set the threshold several weeks earlier or later. One of the more rational responses I’ve seen says “Scientific data, not religious or political conviction, should guide the desperately needed research in this field. In the meantime, it seems prudent to avoid pain during gestation.” After all, even the possibility of causing unnecessary pain requires preventative action. This would apply both to surgical procedures and, a fortiori, to second- and third-trimester abortion procedures which involve crushing and/or tearing the limbs from a living fetus. There are so many entries in the World Solar Challenge this year that I’ve been finding it difficult to get my head around the field. Hence this wall chart, which my readers might also find useful. The first two columns are Cruiser class entries, and the last column is the Adventure class. Unfortunately not all teams have a picture yet, so I’ll probably update this chart down the track. Click on the image to zoom.